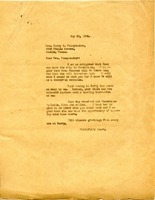 Letter from Martha Berry to Mrs. Percy V. Pennybacker letting her know Inez can not attend Chautauqua but that she has offered the scholarship to Miss Gertie White who graduated from the junior college the previous year. 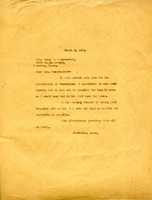 In this letter Martha Berry discusses the scholarship at Chautauqua and Inez's inability to come. 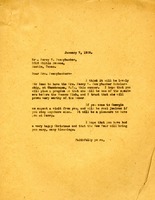 Hammond sends articles from the Pilgrims in case they can be used in the Highlander. Hammond spoke about Berry recently, which led to an invitation for Berry to speak in the fall. Arrangements for Berry to speak at St. Bartholomew are in progress. 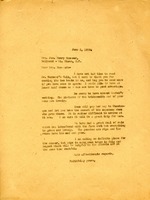 Letter discusses planned trips that summer for Inez and Martha Berry. 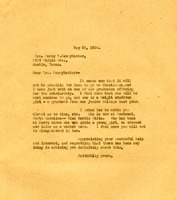 Letter mentions Rachel's wedding pictures. 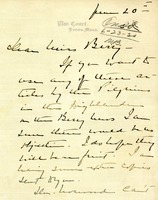 Pennybacker regrets that since she has sent a letter urging that the Pictorial Review Award be given to Carrie Chapman Catt on the basis of her work for peace, she cannot also support Berry. Pennybacker commits to supporting Berry next year. MacCready asks if the films about Berry she saw at Chautauqua were available to show the students and teachers at Masten Park High School. 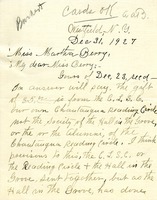 Jordan, secretary of the Chatauqua Literary & Scientific Circle, encloses the organization's contribution of $5.